Native fish tend to rest at these areas and deep pools throughout the day. They venture out from these favourite havens in early morning and at dusk when there is very little light; or when they feel safe in there surrounds. These are key fishing spots can be found in the foothills, cliff faces and rocky points in or running through public access, reserves and private property. Just remember to use proper fishing etiquette if you wish to fly fish on private property. The best advice I can offer, is to never pass by any small creek or river system if it has shallow water. And if it looks too difficult to cast at, that’s the spot to have a shot at as you may be amazed at the size of the fish living beneath the water! 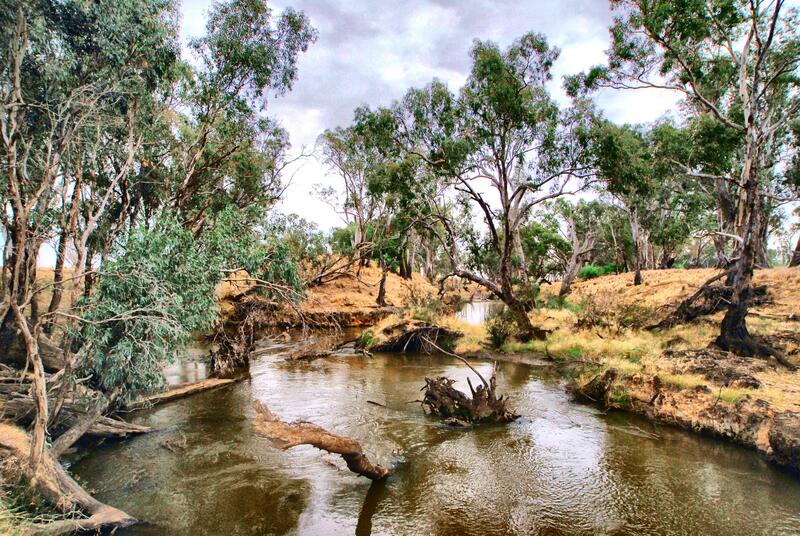 However, there are many small creeks and rivers and lakes where you can fly fish from the water’s edge for Murray cod or Golden perch locally. 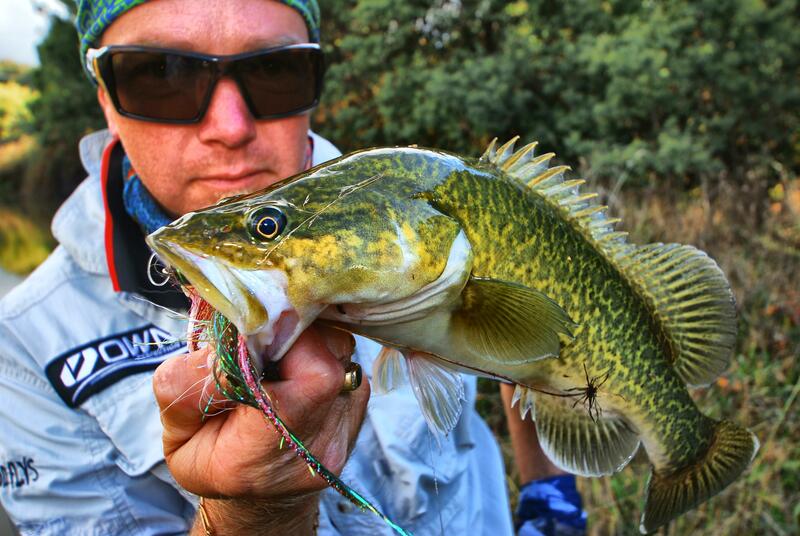 Everyone loves a Murray cod Thumb! 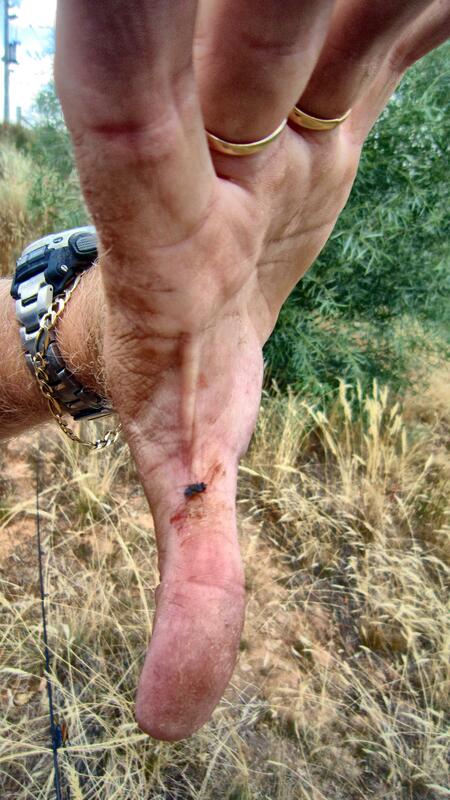 Murray cod thumb, just about one of the most talked about injury while out fishing. Murray cod have a large mouth lined with pads of very small needle-like teeth. The jaws of the Murray cod are equal, or the lower jaw protrudes slightly. As the above picture shows Murray cod have no mercy and once returned to the water the cod bits down and barrels away not thinking twice! The result – COD THUMB! Twisted fly leader – Demonstration. I’ve been tying my own leaders for Murray cod fly fishing out of 20lb, 40lb and 60lb Black Magic mono. This is quite an easy leader to tie and connects to a welded loop knot or braid loop at the end of any fly line. The video goes over 3mins and it takes though the easy steps to tie your own. There is a little wind noise but you’ll get the message. The Venture of Fly Fishing Cod. Murray cod and other native fish tend to rest in deep or shallow pooled water throughout the day. They venture out from these favorite havens in early morning and at dusk when there is very little light; or when they feel safe in there surrounds. These are key fishing spots can be found in the foothills, cliff faces and rocky points in or running through a farmer’s property and public access points. Just remember to use proper fishing etiquette if you wish to fly fish on private property. The best advice I can offer, is to never pass by any small creek or river system if it has shallow water. And if it looks too difficult to cast at, that’s the spot to have a shot at as you may be amazed at the size of the fish living beneath the water!